LynchyRightNow: Not So Fast: Detroit Welcomes . . .
We had the hole puncher on the ticket, the Louisville Cardinals would be the 3rd Big East Conference team headed to Detroit and the Final Four. 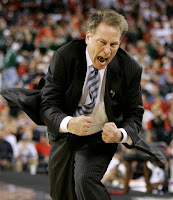 Apparently, someone forgot to tell Tom Izzo and the Spartans of our plans. Michigan State came out and shut down the Big East regular season and conference tournament champions by holding them under 60 points for the first time since February 12th. With that, Detroit will be invaded by the fans of the green & white from East Lansing, and the Final Four is set. North Carolina Tar Heels (32-4) Carolina has hit their stride. The South Regional champions entered the tournament well rested after their early round exit in the ACC Tournament. All questions regarding the injury that had hampered point guard Ty Lawson, seem to have been answered. After sitting out Carolina's first round game, Lawson has stormed back to average 20 points a game while going 7 of 11 from behind the arc over their next three wins. Between Lawson, Danny Green, and of course Tyler Hansbrough, the Tar Heels are the most experienced and well groomed team remaining in the Final Four. Their most impressive win in the Tournament was the victory that got them to Detroit. Against Oklahoma, the Tar Heels were able to hang with Oklahoma and Blake Griffin on the glass, they shot nearly 94% from the charity stripe, and 51% from the floor. On a night when their premier talent Tyler Hansbrough scored just eight points, Lawson and Green chipped in for a combined 37 points including 4 three balls. Roy Williams' veteran squad is returning to their second straight Final Four and looking to reach the championship game for the first time since their schools 2005 National Championship season. Tournament Resume: (16) Radford, (8) Louisiana State, (4) Gonzaga, and (2) Oklahoma. Connecticut Huskies (31-4) The chips are falling directly into place for Jim Calhoun to return to the championship game for the first time since his 2004 National Championship. After out rebounding the Missouri Tigers by 19 boards, and getting a huge contribution off the bench from super-freshman, Kemba Walker, the Huskies arrive in Detroit poised to bring another championship back to Storrs. Calhoun's squad adds a different element than the other remaining teams, scoring depth. The Huskies have had a new leading scorer in each of their previous four tournament games. In round 1, forward Stanley Robinson scored 24 points to lead all scorers, shooting 11-17 from the floor. In round 2, guard A.J. Price nailed four three pointers en route to a 27-point performance. Round 3 saw the Huskies have four starters score in double figures lead by senior guard Craig Austrie and his 17 points. Finally in an exciting Elite Eight game, the Bronx native Kemba Walker, shot 7 of 9 from the floor scoring 25 points. The kicker? We haven't even mentioned the Huskies powerful front court. 7-3 center, Hasheem Thabeet has recorded 45 rebounds thus far and senior forward, Jeff Adrien has recored 40 rebounds to go along with 14 ppg average. The Huskies are more than solid off the bench and can score from all angles, widely considered the tournaments most talented team. Tournament Resume: (16) Chattanooga, (9) Texas A&M, (5) Purdue, and (3) Missouri. Villanova Wildcats (30-7) The team that arrives in Detroit fresh off a Scottie Reynolds last second game winner, sure isn't the same team that was down ten to the Patriot League champion American Eagles heading into the half of their first round game. No, these Wildcats haven't looked back since that half of basketball. Jay Wright's squad is averaging 81 points a game in this tournament and their spreading those points around. Dwayne Anderson and Dante Cunningham dominated inside against American in the second half of game 1. Round 2, the Villanova bench outscored UCLA 29-12 led by the two Corey's, Stokes and Fisher, a game that saw Villanova finish with six players in double figures. 'Nova came out and routed a certain ACC powerhouse in the round of sixteen, a balanced attack from guards Reynolds and Reggie Redding sent that powerhouse home early. Villanova's first appearance in the Final Four since 1985 should be a memorable one. They've got an underrated big man in Dante Cunningham, who is coming off a 6 of 11 shooting night while facing Pitt big man, DeJuan Blair. Seniors Dwayne Anderson and Shane Clark fly under the radar while they've both had fantastic tournament runs. Of course, fan favorite Scottie Reynolds is the motor of this offense and can play with any guard left in this tournament. The East Regional champs are here for a reason. Tournament Resume: (14) American, (6) UCLA, (2) Duke, and (1) Pittsburgh. Michigan State Spartans (30-6) Still think the Big 10 is soft? With the Road to the Final Four leading to Detroit, it's clear that Michigan State is by far and away the home team. The Spartans have had the best and hardest weekend of any of the Final Four teams. After knocking off the defending National Champions, Izzo and Co. knocked off the #1 overall seed. Head coach Tom Izzo has his team playing great defense. After Southern California stud, Taj Gibson scored 24 points in round 1, Michigan State held him to 3 points in round 2. The State defense forced Kansas into 19 turnovers in the sweet 16. Finally, after 13 straight games scoring over 60 points, the Louisville offense was shut down by Michigan State, allowing them to score just 52 points, only 25 in the second half. With the victory over Louisville one thing stood out more than any other, a 6-10 center named Goran Suton. Suton presents difficulties inside for opponents, in the tourney he's transformed into something more. 19 points and 10 boards against Louisville, 20 points and 9 boards against Kansas, and another double-double in round 1. Suton gives Michigan State that "x" factor they'll need to finish off their run. This Tom Izzo lead team may not have the players of his previous Final Four teams, but they are just as effective and with the hoards of screaming green & white fans that will show up at Ford Field, they'll be tough to beat. Tournament Resume:(15) Robert Morris, (10) Southern California,(3) Kansas, and (1) Louisville. Michigan State v. Connecticut Goran Suton doesn't present exactly what DeJuan Blair did to Hasheem Thabeet, but he does cause problems inside. UConn didn't want to play Michigan State, in my opinion they match up better with Louisville and already beat them once this season. There is something to be said about playing a team you know you can beat and your familiar with. Tom Izzo has more than one Final Four under his belt, he'll have his guys ready to play Connecticut. If UConn still had Jerome Dyson, I'd say they may present too many obstacles for this Michigan State team, but A.J. Price and Stanley Robinson will have to show up like they have all tournament to prevent State from advancing. This Connecticut team has played great as of late. Winner: Connecticut. I expect Jeff Adrien and Kemba Walker to show up big for UConn on Saturday. Either way this Saturday's games are sure to be promising, and the prospect of seeing a Carolina v. Connecticut showdown on Championship Monday, would be flat out great.